Heat recovery on continuous flow column dryers can save 10 to 25% by recycling the exhaust air from the cooling or lower heating section of the dryer. 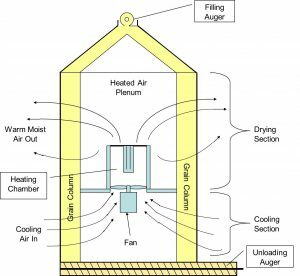 For a dryer with a cooling section, heat recovery can be done by drawing a percentage of the intake air for the heating section through the grain to cool the grain while preheating the air entering the heating chamber. Air can also be recycled from both the lower heat section and the cooling section to reclaim additional heat. Recycling air does reduce dryer capacity slightly depending on the moisture content of the recycled air. Heat recovery can not typically be added to an existing dryer as it is usually an integral part of the dryer design. 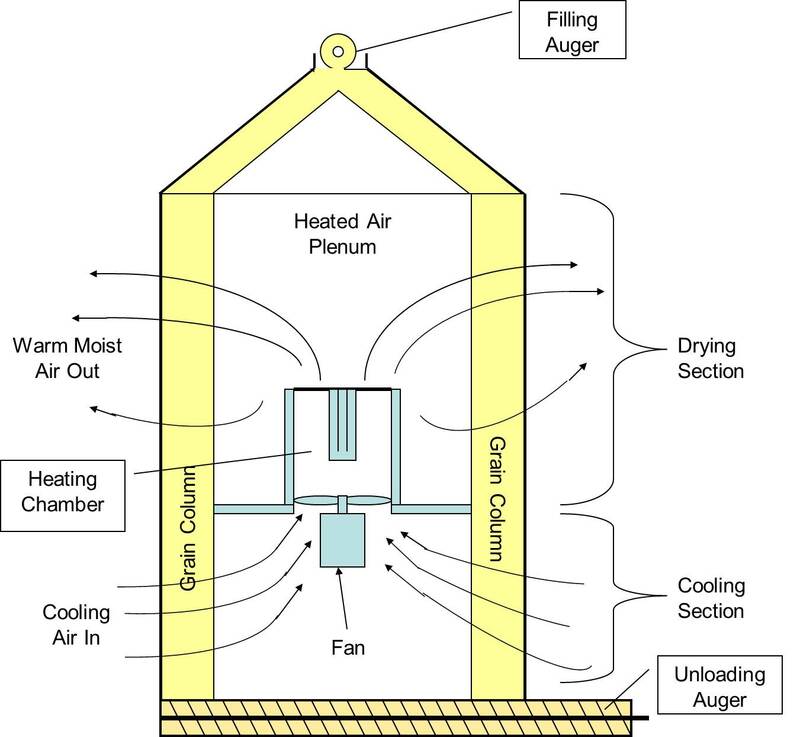 Cooling grain in a dryer reduces the drying capacity and rapid cooling will cause kernels to stress crack which may lead to lower value of the grain due to broken kernels. Using a full heat dryer and transferring the grain to a bin for cooling at a slower rate will save energy and improve grain quality. The grain can be transferred to the cooling bin at 1 to 3 % moisture above the desired storage moisture level depending on the cooling method used. Getting the grain out of the dryer sooner will increase dryer capacity and reduce the energy input. In-Bin cooling: With this cooling method the grain can be transferred to a bin at 1 to 1.5% moisture higher than the desired storage moisture. Fans with a capacity of 1/2 to 1 cubic feet per minute per bushel of grain are needed. The rate will depend on how fast the grain needs to be cooled to keep up with your harvest schedule. In-bin cooling can reduce drying energy input by 10 to 15%. Dryeration is a steeping method and will save the most energy and provide the best grain quality.The grain is transferred hot at 2 to 3% moisture higher than the desired storage moisture to a bin and allowed to “Steep” without air flow for 4 to 12 hours. After the steeping time, the fans are turned on and the grain cooled. After the grain is cooled, it must be moved to a different storage bin otherwise there will be spoilage along the bin walls where condensation forms due to the cooler bin walls. This method will typically require 2 bins that are switched between steeping / unloading and filling every-other day. Dryeration can reduce energy input by 20 to 25%.